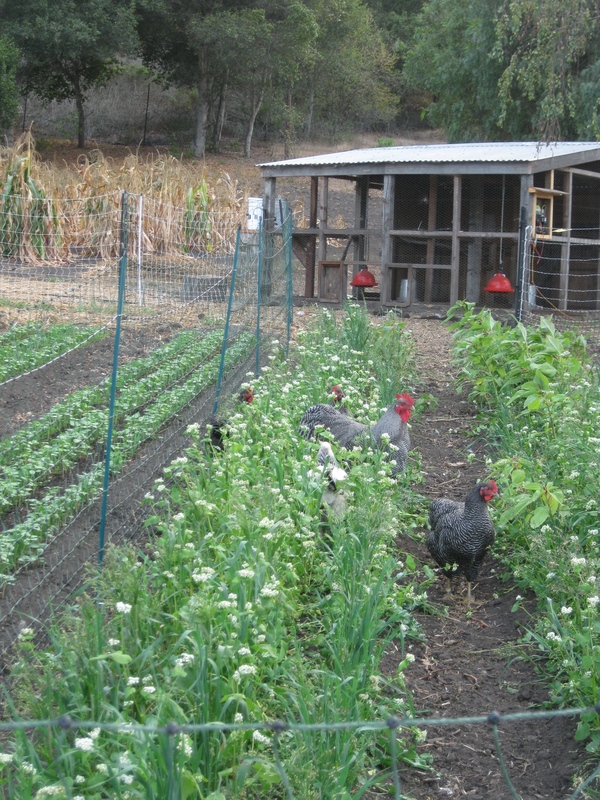 When we first got chickens we fed them mostly with purchased organic feed (we started with Modesto Milling, and later moved to Scratch and Peck, which the chickens love), supplemented with kitchen scraps and whatever bugs and plants they could scrounge from our property, over which they had free range at the time. We soon got tired of the mess, and decided to restrict the birds to just a portion of our land. 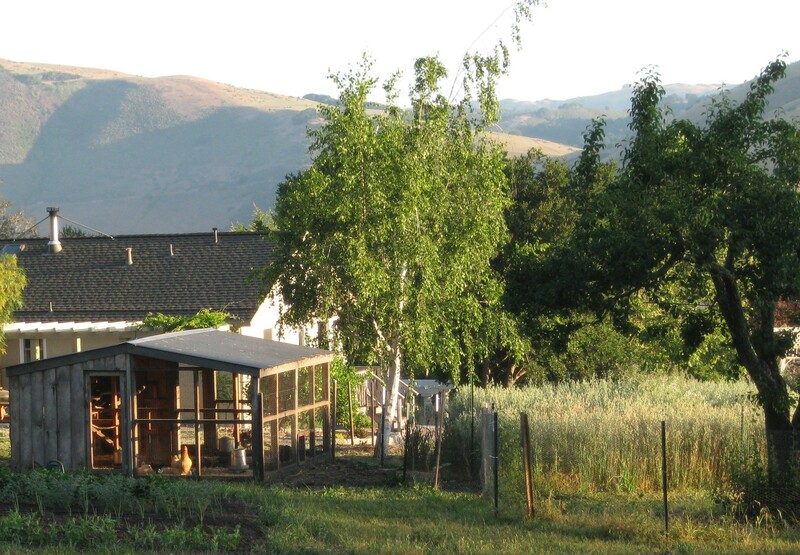 This next photo shows the coop with a portion of the original chicken yard to the right of it. There was a pear tree in the yard for shade, and we were growing a patch of oats right outside the yard. 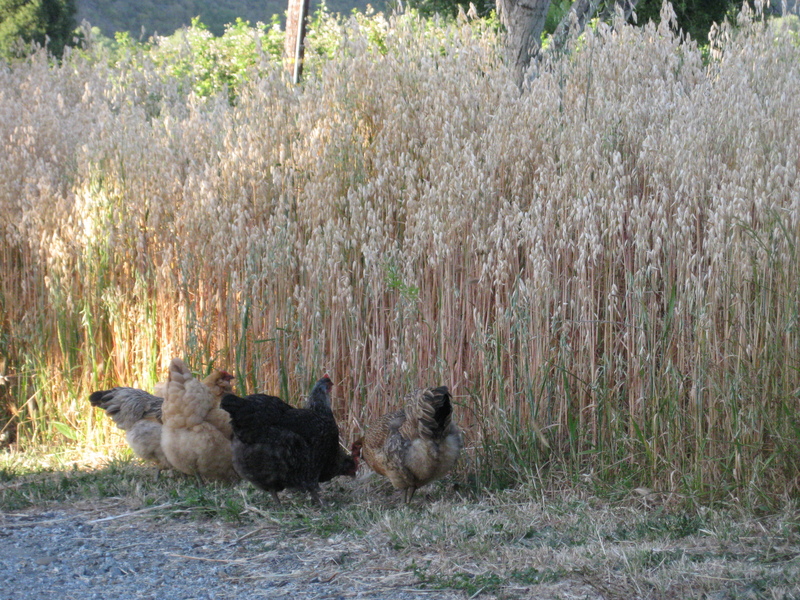 After harvesting the oats we expanded the yard so that the chickens could scavenge the leftover grain. We wanted to improve this situation – we wanted the chickens to have access to the highly diverse diet that they had enjoyed previously, but at the same time keep them isolated to just one section of our property. We tried harvesting greens for them every day, but that got old fast. 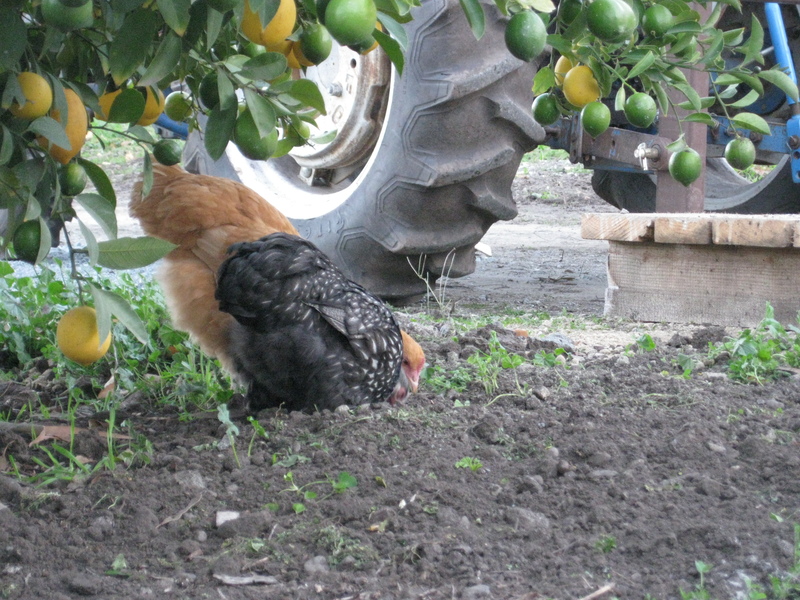 Plus, the chickens were far less interested in loose plant leaves than they were in plants anchored either in the ground or in my hands. During the same period, we decided to see how much of their total feed, not just their greens, we could grow ourselves. 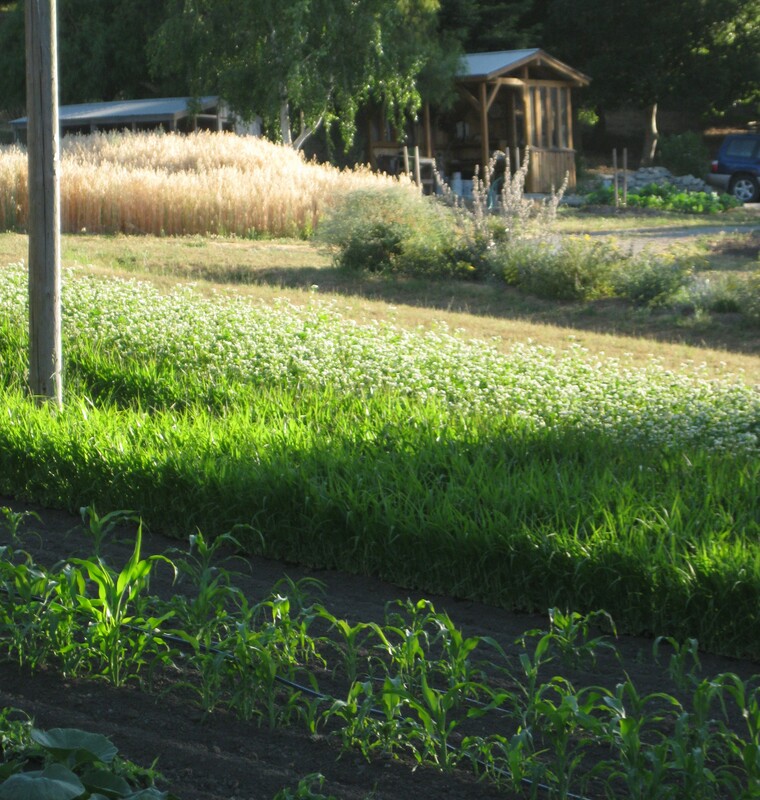 So we grew field corn, white and red proso millet, buckwheat, and oats, plus experimental quantities of peas, flax seed, sunflower and safflower seeds, and amaranth. Corn, millet, and buckwheat, with golden oat patch in background. In addition to feeding the mature grains, we also fed a daily ration of sprouted wheat, from seed grown by a neighbor, and periodic treats of yogurt and lightly-soured milk. We assumed that our chickens would be able to select from the supplemental items we were giving them in nutritionally optimal proportions; however, I’m not sure this is always true. After we had been feeding supplemental rations in a haphazard way, a couple of our meat chickens showed symptoms of fatty liver upon butchering: their livers were pale, enlarged, and broke apart easily. Then a favorite bantam hen got sick, and was positively diagnosed with fatty liver by the UCD Avian Pathology Lab. This made us immediately stop and reconsider our feed strategy. Chickens have specific nutrient needs, and commercial feeds are precisely balanced to meet those needs, which works well when feeding chickens that have no other source of nutrition. However, things get more complex when supplementing this feed. Information in the popular press (e.g. Mother Earth News) does not emphasize the importance of nutrient balancing; perhaps the assumption is that the majority of the diet will still come from a purchased source. Searching deeper than the popular press, we found several other sources that provide information on making feed mixtures, including UC Davis, ATTRA, and Harvey Ussery’s small-scale poultry book. When looking through these sources, we realized that we can easily provide the necessary carbohydrates (from our grains), minerals and vitamins (from the pasture), and fat (from walnuts, flax seeds, sunflower seeds, and safflower seeds). Protein, however, has so far been a bit more challenging. Many commercial feeds rely on soybeans for protein, which we would rather not use. We have tried several types of peas, and so far the chickens are uninterested. Sprouting is supposed to increase the bioavailability of protein in grains and seeds, but I have not been able to find specific data on this; I would assume it would be highly dependent on the species and the age of the sprout. We are considering growing black soldier fly larvae for protein, but have not yet committed to this extra level of complexity in our lives. While we work out the best dry feed diet, we have also been focusing on the pasture development. 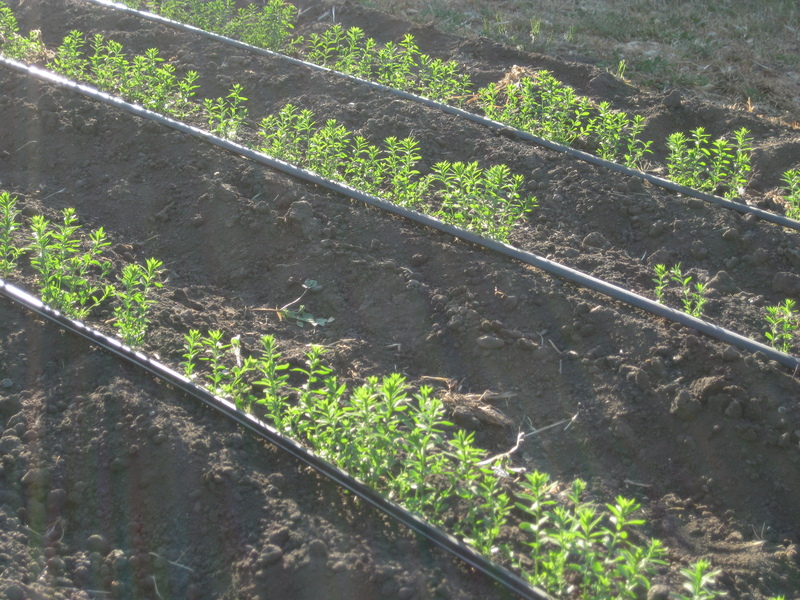 We set up a rotational pasture-type system, using sequential plantings of a mix of crops and re-working the beds between plantings. 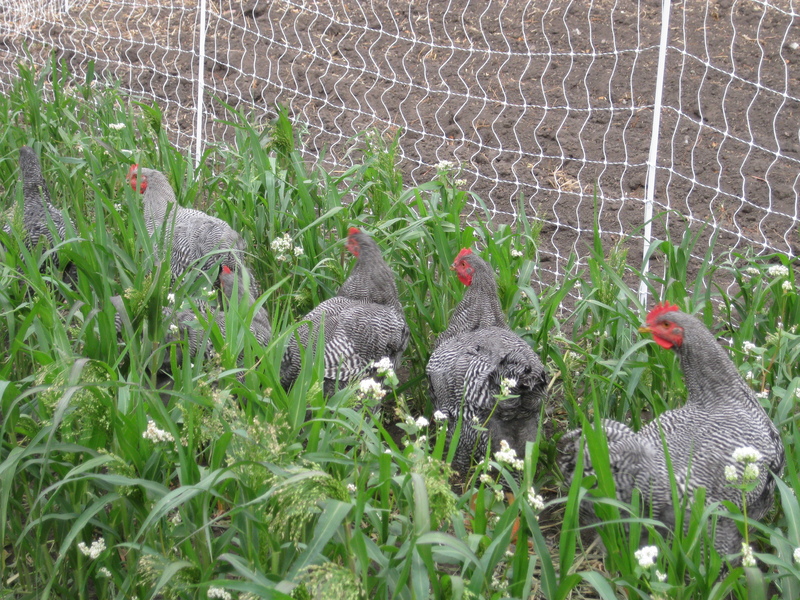 We plant a seasonally variable mixture that includes oats, millet, flax, peas, white and red clovers, and alfalfa, moving the chickens to a new planting monthly. Barred Rocks in managed pasture, with the upcoming pasture patch to the left. The chickens were unimpressed at first, but their interest in the pasture increased greatly once we started limiting their purchased feed. At this point we noticed a subsequent increase in the depth of the orange color of their egg yolks. It would be fun to be able to test the nutrient composition of these eggs, as research has shown that eggs from pasture-raised chickens can be significantly higher in omega-3 fatty acids and vitamins A and E.
We’re still working on their dry feed mix, and I’ll write more about that as we develop it. 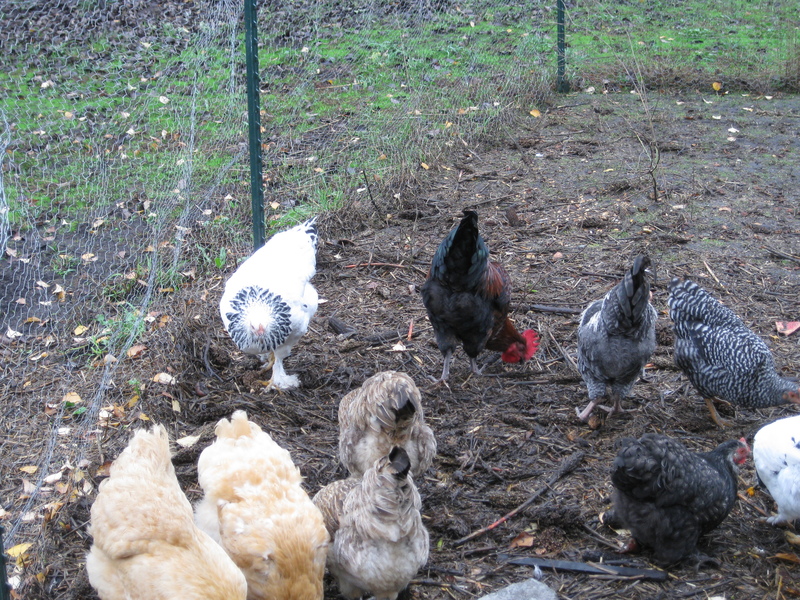 This entry was posted in chickens and tagged chicken feed, chickens, pastured poultry. Bookmark the permalink.